We specialize in invoice printing and producing professional quality multi-part forms, carbonless forms, NCR forms, service forms, work order forms, service repair forms, business forms, receipts and more. Invoices are also referred to as carbonless forms or NCR forms (NCR = no carbon required). The paper is chemically treated to transfer the impression from the first page to each subsequent page with very little pressure. Customize any of our invoice templates or send us a scanned copy of your current form and we will create it for you. Standard sizes for invoices are half page (5.5″ x 8.5″), full page (8.5″ x 11″) and legal (8.5″ x 14″) although custom sizes can be ordered to meet your company’s specific need. The design orientation can be either vertical or horizontal. Invoices can be printed on one side or two. Typically the front side contains the form itself. The back side can be used for legal information or detailed instructions. Order invoices loose, padded, or bound into a booklet—a common binding used for receipts. 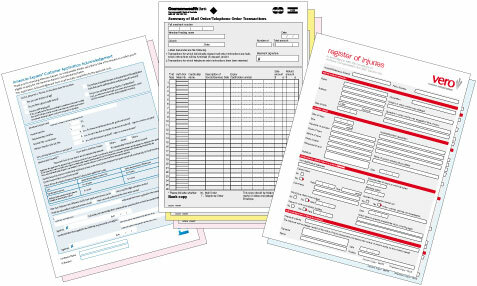 We can also provide you with sequentially numbered forms. Just specify red or black ink and the starting number and all forms will be numbered sequentially. Choose from several environmental friendly carbonless paper options. All our carbonless paper is recyclable. Want more information on invoice printing? Upload your files. A member of our sales team will be in contact with you regarding your files. Request a quote . A member of our sales team will be in contact with you regarding your request. Contact us for more information about our professional invoice printing services.